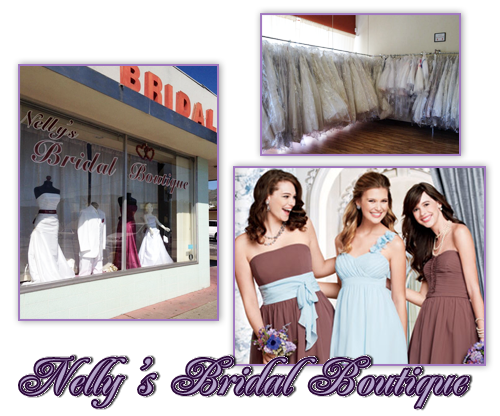 Nelly’s Bridal Boutique “where memories that last a life time begin” features contemporary and traditional wedding gowns and bridesmaid dresses representing over 16 prestigious American and European bridal designers. We offer a big selection of designer wedding, bridesmaid, flower girl, and mother of the bride dresses including Pronovias, St.Patricks, White One, Alfred Angelo, Mary’s, Jasmine, Jade Couture, BELSOI, B2, Eden Bridals, Moonlight Bridal, Bari Jay, Jordan Fashions, Dessy, Alfred Sung, After Six, Me too, and many more! We have been in business since 2004, and have been in the bridal industry for over 20 years. Our goal is to provide you with the best customer service and competitive prices in the Bay Area. Visit us at our South San Francisco location to find the dress that will make your special day a dream come true. dresses out for me including the ONE! for my bridesmaids dresses. The staff is so helpful and patient. and Eden bridesmaids dresses. You can also buy wedding gowns at her store as well.